To view 8 more pictures, interactive maps and the full, detailed description of the Old Beach Village community, please Login. A condo in Old Beach Village offers new construction in a seashore hideaway. Builders have taken precise care to ensure each home is attractive, safe and modern. This complex is nestled near the shore of the Atlantic coastline next to the 31 Ocean area in Virginia Beach, VA. Military bases such as NAS Oceana and Joint Expeditionary Base Little Creek-Fort Story are minutes away but residents get the joy of coming home to this amazing oceanside neighborhood. A truly unique feature about this new construction development is the availability of two styles of homes. The Lofts at Old Beach Village showcases contemporary loft-like living spaces. Builders knew that single professionals and young couples would particularly appreciate this styling. Each condo here may come with private balcony, storage space, ceilings over 11 feet tall, exposed ductwork, stained finished concrete floors, maple Merillat kitchen cabinetry, breakfast bar, Kohler plumbing fixtures, walk-in closets and much more. 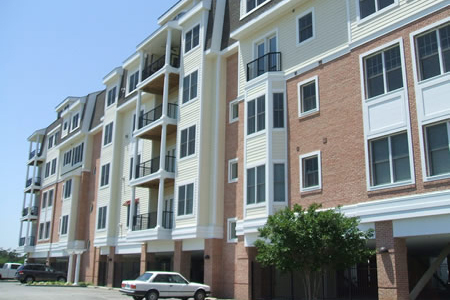 The Flats is the other option at Old Beach Village. These new construction homes offer as little as two and as many as five bedrooms. Each condo here may include oak stair treads with coordinating handrail, gas fireplace with slate hearth, brushed nickel lighting fixtures, Corian kitchen countertops, kitchen island, GE appliances, pendant lighting, kitchen pantry and much more. People flock from all over to this part of Virginia, so it’s no stretch to say this place rocks. The Virginia Beach Oceanfront is a flurry of fun activities. Locals can admire the 34-foot tall statue of King Neptune at Neptune Park. Shop at the many boutiques and shops around this redesigned, new construction area. Dine at some of the best seafood restaurants on the East Coast. And by all means, don’t forget the beach! A condo is just the thing for homebuyers wanting a change of pace. When living near the beach is a priority, come over to this side of town. For low-maintenance living near the shore, try Old Beach Village for that new lease on life. Send me more information about the Old Beach Village new home community. Our agents gladly offer FREE property tours of Old Beach Village, Virginia Beach and homebuyer consultations to all serious buyers.